The miraculously supplied food on which the Israelites subsisted in the wilderness. Its name is said to have originated in the question ("What is it?" Ex. xvi. 15, R. V.; comp. Rashi ad loc. ), asked by the Israelites when they first saw it. 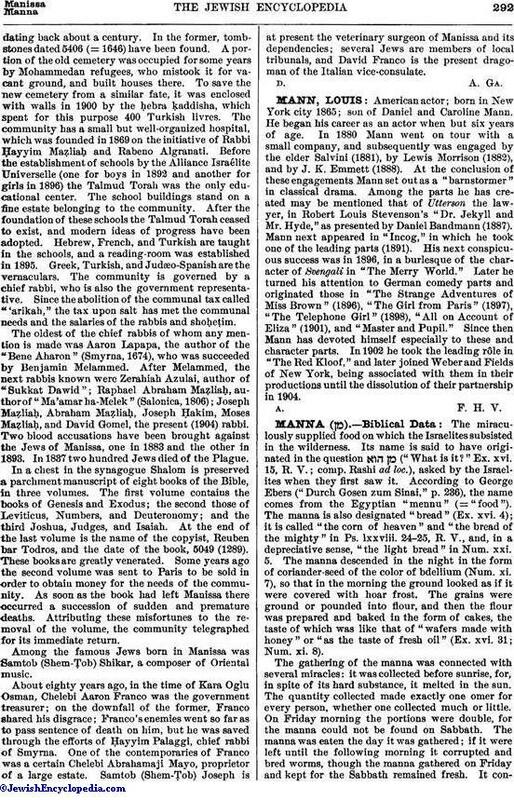 According to George Ebers ("Durch Gosen zum Sinai," p. 236), the name comes from the Egyptian "mennu" (= "food"). The manna is also designated "bread" (Ex. xvi. 4); it is called "the corn of heaven" and "the bread of the mighty" in Ps. lxxviii. 24-25, R. V., and, in a depreciative sense, "the light bread" in Num. xxi. 5. The manna descended in the night in the form of coriander-seed of the color of bdellium (Num. xi. 7), so that in the morning the ground looked as if it were covered with hoar frost. The grains were ground or pounded into flour, and then the flour was prepared and baked in the form of cakes, the taste of which was like that of "wafers made with honey" or "as the taste of fresh oil" (Ex. xvi. 31; Num. xi. 8). The gathering of the manna was connected with several miracles: it was collected before sunrise, for, in spite of its hard substance, it melted in the sun. The quantity collected made exactly one omer for every person, whether one collected much or little. On Friday morning the portions were double, for the manna could not be found on Sabbath. 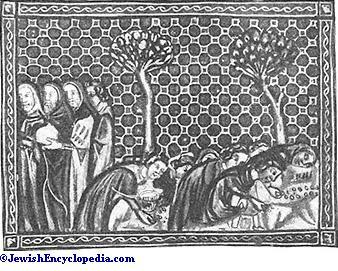 The manna was eaten the day it was gathered; if it were left until the following morning it corrupted and bred worms, though the manna gathered on Friday and kept for the Sabbath remained fresh. It continuedto descend during the forty years the Israelites were in the wilderness, but when they arrived at Gilgal, on the 14th of Nisan, and began to eat the grain grown there, the manna ceased to fall. In order to perpetuate the memory of this providence, Aaron was told to put an omer of manna in a vessel and lay it "before the testimony" (Ex. xvi. 17-35; Josh. v. 10-12). Num. xxi. 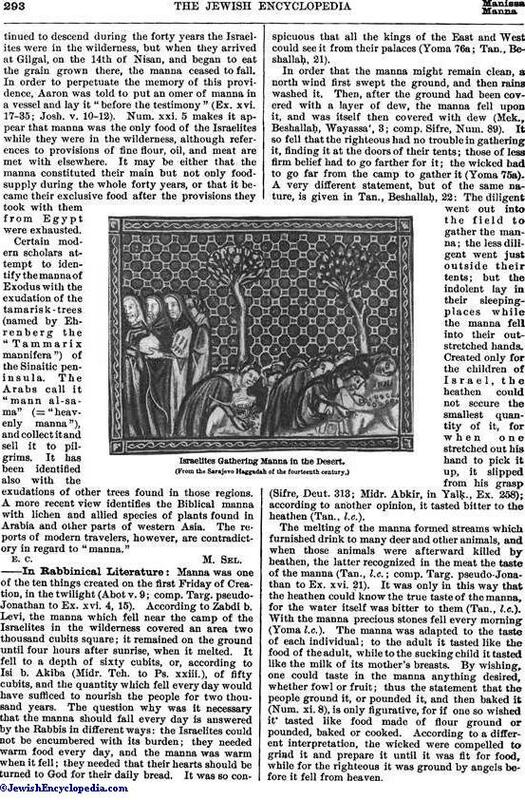 5 makes it appear that manna was the only food of the Israelites while they were in the wilderness, although references to provisions of fine flour, oil, and meat are met with elsewhere. It may be either that the manna constituted their main but not only food-supply during the whole forty years, or that it became their exclusive food after the provisions they took with them from Egypt were exhausted. 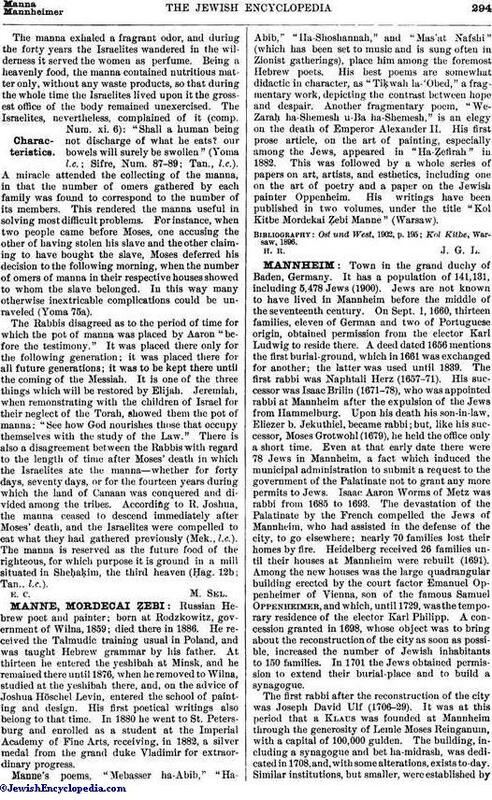 Certain modern scholars attempt to identify the manna of Exodus with the exudation of the tamarisk-trees (named by Ehrenberg the "Tammarix mannifera") of the Sinaitic peninsula. The Arabs call it "mann al-sa-ma" (= "heavenly manna"), and collect it and sell it to pilgrims. It has been identified also with the exudations of other trees found in those regions. A more recent view identifies the Biblical manna with lichen and allied species of plants found in Arabia and other parts of western Asia. The reports of modern travelers, however, are contradictory in regard to "manna." Manna was one of the ten things created on the first Friday of Creation, in the twilight (Abot v. 9; comp. Targ. pseudo-Jonathan to Ex. xvi. 4, 15). According to Zabdi b. Levi, the manna which fell near the camp of the Israelites in the wilderness covered an area two thousand cubits square; it remained on the ground until four hours after sunrise, when it melted. It fell to a depth of sixty cubits, or, according to Isi b. Akiba (Midr. Teh. to Ps. xxiii. ), of fifty cubits, and the quantity which fell every day would have sufficed to nourish the people for two thousand years. The question why was it necessary that the manna should fall every day is answered by the Rabbis in different ways: the Israelites could not be encumbered with its burden; they needed warm food every day, and the manna was warm when it fell; they needed that their hearts should be turned to God for their daily bread. It was so conspicuous that all the kings of the East and West could see it from their palaces (Yoma 76a; Tan., Beshallaḥ, 21). In order that the manna might remain clean, a north wind first swept the ground, and then rains washed it. Then, after the ground had been covered with a layer of dew, the manna fell upon it, and was itself then covered with dew (Mek., Beshallaḥ, Wayassa', 3; comp. Sifre, Num. 89). It so fell that the righteous had no trouble in gathering it, finding it at the doors of their tents; those of less firm belief had to go farther for it; the wicked had to go far from the camp to gather it (Yoma 75a). A very different statement, but of the same nature, is given in Tan., Beshallaḥ, 22: The diligent went out into the field to gather the manna; the less diligent went just outside their tents; but the indolent lay in their sleeping-places while the manna fell into their outstretched hands. Created only for the children of Israel, the heathen could not secure the smallest quantity of it, for when one stretched out his hand to pick it up, it slipped from his grasp (Sifre, Deut. 313; Midr. Abkir, in Yalḳ., Ex. 258); according to another opinion, it tasted bitter to the heathen (Tan., l.c.). Israelites Gathering Manna in the Desert. The melting of the manna formed streams which furnished drink to many deer and other animals, and when those animals were afterward killed by heathen, the latter recognized in the meat the taste of the manna (Tan., l.c. ; comp. Targ. pseudo-Jonathan to Ex. xvi. 21). It was only in this way that the heathen could know the true taste of the manna, for the water itself was bitter to them (Tan., l.c.). With the manna precious stones fell every morning (Yoma l.c.). The manna was adapted to the taste of each individual; to the adult it tasted like the food of the adult, while to the sucking child it tasted like the milk of its mother's breasts. By wishing, one could taste in the manna anything desired, whether fowl or fruit; thus the statement that the people ground it, or pounded it, and then baked it (Num. xi. 8), is only figurative, for if one so wished it tasted like food made of flour ground or pounded, baked or cooked. According to a different interpretation, the wicked were compelled to grind it and prepare it until it was fit for food, while for the righteous it was ground by angels before it fell from heaven. The manna exhaled a fragrant odor, and during the forty years the Israelites wandered in the wilderness it served the women as perfume. Being a heavenly food, the manna contained nutritious matter only, without any waste products, so that during the whole time the Israelites lived upon it the grossest office of the body remained unexercised. The Israelites, nevertheless, complained of it (comp. Num. xi. 6): "Shall a human being not discharge of what he eats? our bowels will surely be swollen" (Yoma l.c. ; Sifre, Num. 87-89; Tan., l.c.). A miracle attended the collecting of the manna, in that the number of omers gathered by each family was found to correspond to the number of its members. This rendered the manna useful in solving most difficult problems. For instance, when two people came before Moses, one accusing the other of having stolen his slave and the other claiming to have bought the slave, Moses deferred his decision to the following morning, when the number of omers of manna in their respective houses showed to whom the slave belonged. In this way many otherwise inextricable complications could be unraveled (Yoma 75a). The Rabbis disagreed as to the period of time for which the pot of manna was placed by Aaron "before the testimony." It was placed there only for the following generation; it was placed there for all future generations; it was to be kept there until the coming of the Messiah. It is one of the three things which will be restored by Elijah. Jeremiah, when remonstrating with the children of Israel for their neglect of the Torah, showed them the pot of manna: "See how God nourishes those that occupy themselves with the study of the Law." There is also a disagreement between the Rabbis with regard to the length of time after Moses' death in which the Israelites ate the manna—whether for forty days, seventy days, or for the fourteen years during which the land of Canaan was conquered and divided among the tribes. According to R. Joshua, the manna ceased to descend immediately after Moses' death, and the Israelites were compelled to eat what they had gathered previously (Mek., l.c.). The manna is reserved as the future food of the righteous, for which purpose it is ground in a mill situated in Sheḥaḳim, the third heaven (Ḥag. 12b; Tan., l.c. ).